Fearful and confident. Those are the emotions we all shared as we prepared for our upcoming return journey from Kitindi to Bukavu. 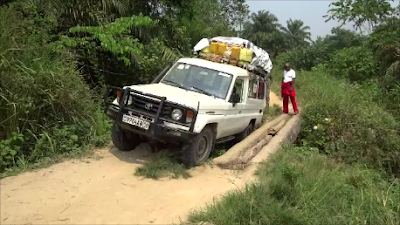 Our driver assured us that now that he knew the road he could avoid the various problems we had on the way in. I’m not sure how that logic works, but we all had hope of reaching Bukavu in the one day it should take. Wait, what is that noise? Oh, it’s only the now broken shocks…eh, no problem (serious sarcasm). 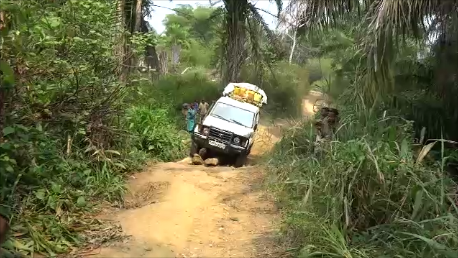 Several times the shock problem worsened and we all exited the vehicle. With no way to actually fix it way out here, the decision was made to continue carefully and slowly. We successfully passed the former traps, though a bit more blue in the face for having held our breath so many times. Having departed at 7:30 am, by 11:30 we’d passed the major obstacles this side of the hospital. And…just when we thought we might be home free…we somehow managed to straddle a log over a somewhat high ravine. The two font tires were on solid ground and the two back tires straddled the log. Four hours and a major miracle later we were free, but we were also keenly aware that we’d not reach Bukavu that day as planned. The shocks worsened but our options failed to expand until we reached a village near’ish the hospital. Two hours of work on replacing that shock and it was obvious we’d go no further. Darkness set in and several of us were motorcycled to the main gate of that now familiar resting place, whose water pipes had since pursed and thus afforded us no bathing luxuries. The end of day one, whew!